Before talking about what’s changed, we need to know where things stood before the change. You’ve probably heard about Arthur Lydiard, who was probably the most influential running coach ever. Many generations of runners ago, he formalized the linear periodization model of training, which is shown in the accompanying diagram (borrowed from Steve Magness’s Science of Running). In this model, there is a ton of low-intensity running early in the season. It wasn’t at all uncommon for runners to be hitting over 100 miles per week. As the season progressed, intensity was introduced most notably with hill intervals, which focus on strength-endurance. Finally, as the race season drew near, intervals at the track were introduced. These intervals started longer and got shorter and faster as time went by. This model is perfectly fine for training and many people still thrive by it. In general, I think that the people who do best on this method of training are athletes that Greg McMillan calls “endurance monsters” because they can bounce back more easily from the tons of volume that the early season requires. I would not be one of those athletes. You may have also heard about another famous running coach, Jack Daniels, who varies this periodization model in a slight but very significant way. In his approach, you start with the same aerobic base-building as the Lydiard model but switch the last two components of intensity. Specifically, after building a great aerobic base, the athlete following the Daniels formula switches to high speed, max VO2 work for a few weeks before lengthening out the speed work to becoming something much more specific to the demands of racing. I think that the Daniels approach comes closer to the way that I would approach my training but isn’t quite there yet. I like the idea of maxVO2 work to set the foundation for highly specific speed that comes later. But I don’t like the absence of speed earlier in the model. Renato Canova is probably the most successful coach who is associated with a different, newer periodization model. This model is called “funnel periodization” because it combines volume and intensity that are very non-specific to the athlete’s race needs– and then “funnels” them to become highly specific to race needs.. Regardless of whether most elite running coaches consider themselves part of this camp or not, the fact remains that it is highly-influential. In fact, one survey of super elite runners showed that the majority of them followed this funnel periodization in one form or another— they start with a “polarized” combination of speed and volume before becoming more specific in their intensity as competition draws near (see The Search for the Perfect Intensity Distribution, Running Research News, December 2004). As Canute’s Efficient Running site noted, this polarized model also worked well for Haile Gabrselassie and Jack Foster to keep their speed well into middle age. Funnel periodization works in a different way than linear periodization. At the beginning of the season, workouts combine two qualities– short, super-intense efforts or long steady efforts. This builds all-round endurance, but also keeps the neuromuscular system primed for running fast. Brad Hudson’s book, Run Faster, advocates easy runs together with a few 8-second all-out uphill running blasts. This is a perfect example of this combination of opposite extremes of running. Unlike the linear periodization model, running volume doesn’t start high but initially ramps up before coming back down. As race season draws near, workouts become more focused to the demands of racing– intervals get longer, tempo runs get introduced– all with a laser-like focus on the demands of the race. There are three reasons why I love this model. 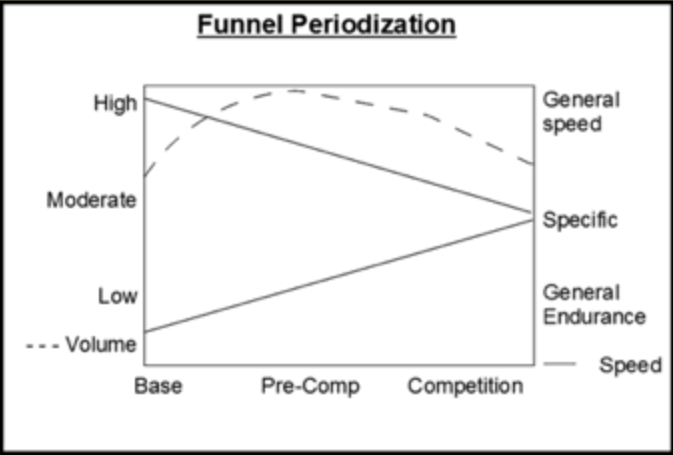 Funnel Periodization is More Specific. It’s the last characteristic mentioned above– specificity– that is of particular appeal to me. Everything starts either much faster or much slower than the race requirements. But, as time moves on and race season gets closer, everything in the model starts to build focus to exactly what the race requires. Primes All Energy Systems. Steve Magness also points out that once an energy system is introduced (e.g. tempo runs) in funnel periodization, it stays in throughout the season. While the emphasis will obviously change towards energy systems specific to the demands of racing, an occasional taste of stuff from months ago still is needed every now and again. This is critical in my opinion for keeping the fitness gains that I worked so hard in achieving. Speed isn’t Rudely Introduced Out of Nowhere. A third reason that I prefer this model of periodization is that speed is emphasized from the beginning. In fact, the model starts at a higher level of speed than anything that comes after. This just makes sense to me as, in the classic Lydiard model, I always wondered how an athlete can really run fast after month after month of nothing but long slow distance training. If one of the key advantages to funnel periodization is that it creates a rich mix of different stimuli over time, you might ask yourself why not just abandon the changing emphasis of periodization models and do everything all at once? This is an approach advanced by Charles Poliquin, who is probably someone most endurance athletes have never heard of. Back in 2002, some researchers at Arizona State University applied the linear periodization model and the Polinquin “undulating” periodization model to strength training and found that strength gains were significantly higher using the Poliquin undulating model of periodization. Specifically, the researchers divided subjects into two groups. In one group, they had subjects do exercises three times a week at a lighter weight. After several weeks, they exercised using a higher weight. After several weeks at this higher weight, they had subjects exercise at a very heavy weight. You can see clearly how this weight lifting routine follows a linear periodization model. In the second group, they had subjects again lift three times a week but the emphasis never changed. Instead, during every week of the study, they would exercise once using a lighter weight, a second time at a medium weight, and a third time using a very heavy weight. Researchers hypothesized that it was this constant mixing of stimuli that gave the Poliquin group a leg up on their linearly periodized counterparts. Pulling it All Together: What Models Do I Use? 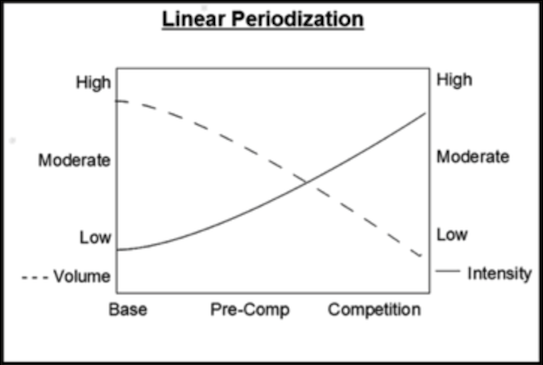 If periodization models are new to you then all this discussion probably has your head spinning. So let’s get to the bottom line and talk about how I use this stuff to direct my training. Here, in a nutshell, is what I do. Follow a Funnel Periodization in Pre-Season Build Up to Race Day. I start my builds around December or January with an early season goal of a couple of February time trials and early spring duathlons. In running, this starts with long runs at an easy tempo plus recovery runs punctuated with either hard 8-second uphill blasts, plyometrics, or strides (not all at once!). In short order, I start in on fast track workouts that build out over the pre-season to 2-3 x 20-30 minute efforts at my one-hour race pace or faster. In cycling, it’s the same formula with Tabata intervals slowly morphing into longer intervals and finally evolving into tempo efforts with an end goal of 2-3 x 20 minutes at FTP on 4 minutes recovery or less. If the build in running or cycling came up very fast (which it frequently does), then I simultaneously start a second build with shorter fast efforts that will hopefully build into tempo efforts at a slightly faster pace. The specifics of how to create these builds are left to a different post, but in the meantime I would direct the reader to Philip Skiba’s Triathlete’s Guide to Training with Power for some good examples. Competitive Season and Early Season Follows a Poliquin Approach. During the race season, it’s all about keeping all cylinders firing– not an easy task if your race season lasts several months. If you’re constantly racing endurance races shorter than a HIM like you should, this means that your lactate threshold energy system is going to be fully developed so you probably won’t need a whole ton of longer lactate threshold work. By contrast, if you live in a submarine and can’t race all the time, then you’ll obviously want to do a ton of lactate threshold work during race season. A typical week should include (1) one hard speed/strength effort (e.g. on the bike, that means Tabata intervals or low cadence hill climbing and for running that means 800-1,600 meter repeats), (2) one hard tempo effort (e.g. 2-3 x 20-30 minutes at lactate threshold or higher with 5 minutes or less recovery) and (3) one long effort. If you were a good kid and raced over the weekend, then you can probably substitute that week’s tempo workout with the long workout that you lost over the weekend. Doing this magic combination of three workouts quickly shows you where your weak spots are. Right off the bat (or sometimes later in the season), I try to make sure to fold in some sports rotation so I don’t totally fry myself. Oddly enough, off-season takes a toned-down version of the same approach using the same formula. It’s “toned down” in the sense that I’m not working on tight timeframes or trying to hit the same performance benchmarks. As long as I hit all energy systems in all sports eventually, I’m fine. If you want more details, fear not! The purpose of this post is to just give a rough lay of the land, mostly looking at things from a theoretical perspective with just a few ties to daily training. It will all come together in the training pages once the foundation work is done.